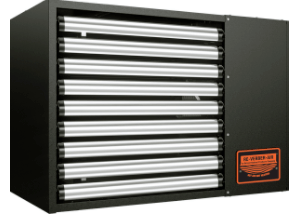 In many commercial, industrial, and agricultural applications, vapors, dust, and various contaminants cannot be continuously kept out of indoor air space, which creates some problems when indoor air is drawn into heaters and used in combustion. First, certain vapors can cause furnace corrosion when used for combustion. Second, there is a risk of both vapors and back-drafted exhaust air entering the machine and causing an explosion. Third, you are paying to heat already-heated air, which is inefficient. Why Use Separated Combustion Heaters? The principle of "separated combustion" eliminates all three problems mentioned above by using only outside air for combustion purposes. Outside air will be fresher and cleaner, free of the troublesome contaminants that are sometimes found indoors. This eliminates a safety hazard, extends the life of your heating unit, and greatly increases fuel efficiency. An intake fan draws fresh air in, while another fan pushes exhaust air through a pipe and back outside. Thus, no new air is brought into the building by a separated combustion heater. Only heat is brought in. This enables 90% or more efficiency, which would not otherwise be possible. Attractive and traditional design, with black-enamel visual surface and stainless steel discharge louvers. 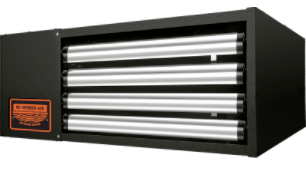 ATI staff can assist you in choosing the precise separated combustion unit heater that best fits your specific application. We market to contractors, distributors, and end users alike and can often offer clients exclusive contracts and/or deals.